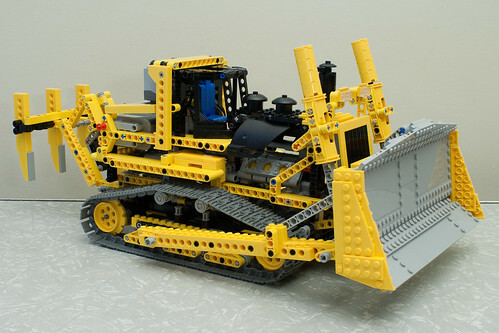 Yes, this is the Lego bulldozer that I mentioned last week. As usual the design is quite ingenious. At each of of the tracks is a large yellow cog, with one XL motor driving the left rear cog with another XL motor driving the right front cog. There are also two normal motors that each drive a worm gear, one for lifting the front blade and the other for the ripper on the back. The remote control is quite funky. The remote itself has two controls and a switch to select one of four channels. 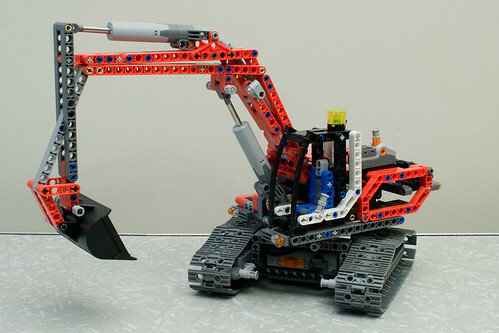 One receiver on the bulldozer controls the two XL motors for the tracks while the other reciever, on a different channel, controls the two motors for the blade and ripper. The battery box is held in by two pins which make it easy to remove in order to change the batteries. For long term display I will probably remove the ripper, but that is easy because it is held on by four pins and a drive connection. A parallel could be drawn with power take-off on real bulldozers/tractors. I do have one regret, that I didn’t build the B model (in this case referred to as a ‘quick build’ as it is nowhere near as complex) first. 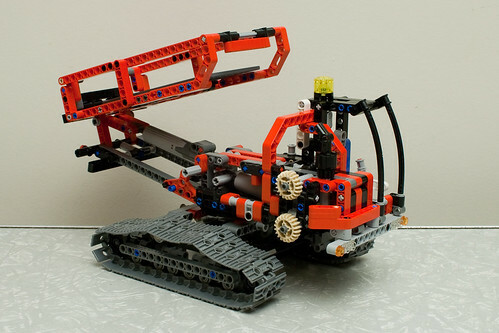 It looks like it would also be fund, but I would have to pull apart the bulldozer and then afterwards pull it apart and rebuild the bulldozer. I don’t know if I could find the time for that. That shouldn’t take too long as it looks like the base with the tracks is only slightly different. So only the top would need to be pulled apart.